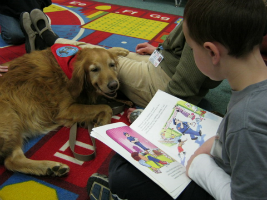 In 2007, Ella and Julius (two mixed-breed, rescued dogs who are registered therapy dogs with Delta Society Pet Partners), began coming to two of our Orange County schools to read with children in the classroom and meet with students in the school social worker's office. The results were amazing, word spread, and other schools wanted to know how they could have visiting dogs. So, in 2010, Pet Pals was born to include additional schools and to provide a more structured program to support pet-assisted therapy and activities. The Pet Pals program could not exist without the volunteer handlers. Teams (a handler/owner and a dog constitute a team) come from the surrounding communities and recruitment involves community-based presentations, information distribution, and networking with national registration organizations, veterinary clinics, pet shops, dog trainers, and community leaders. To show our appreciation, our volunteers receive a Pet Pals ID badge, a tote bag bearing the Pet Pals logo, and a logo bandana for the dogs. To provide support and networking opportunities for the teams, training events and a year-end recognition dinner are also part of the program. There are currently 23 teams working in several Orange County schools, including one high school and one alternative school. The dogs are well-trained and they, with their handlers, must be evaluated, registered, and insured with one of several national organizations such as Pet Partners or Therapy Dogs International. After an interview and background check, a team is assigned to a school where the counselor or social worker matches them with referred students. Students may be referred to work with a dog because of a special need, to practice a skill, or simply as a reward. 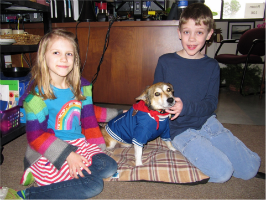 Pet Pals teams can meet with students individually or in groups and whole classrooms might be involved, such as in presentations about animal care or humane education. Depending on the task, work can take place in the classroom, in offices, or outside. Services provided can include Animal-Assisted Activities (AAA) and Animal-Assisted Therapy (AAT). These are similar services, but AAT involves specifically planned, goal-directed interventions, designed for a particular student, with progress measured. For example, a handler brings a dog for planned sessions in which the school occupational therapist directs a child in manipulating items used with the dog (fastening the leash, grooming with a brush, opening a bag of treats, etc.). Notes are kept, and improvements are recorded. In AAA, a handler brings a dog to a classroom for small-group reading. The mission is simply to help the children to learn to enjoy reading in a relaxed setting: no treatment goals are set for the interactions and no specific progress records are kept. In addition to enhancing the environment and promoting our schools as caring and compassionate, working with a dog provides many mental, emotional, physical, social, and motivational benefits. Mental and emotional benefits include reductions in anxiety, improved depressive symptoms, increased attention skills, improved verbal interactions among group members, decreased behavioral problems, and increased self-esteem and feelings of well-being. Work with a dog can improve a student's physicality as demonstrated by improvements in fine motor skills (brushing, stroking) and gross motor skills like balance and coordination (walking the dog). Increased vocabulary and reading fluency, a more positive attitude toward reading, and improvements in long- and short-term memory are among possible academic benefits. Social and emotional gains might involve more willingness to be involved in a group activity, better interactions with others and with staff, enhanced communication and cooperation, as well as better developed empathy and sensitivity. Animal-assisted therapy has a long history, but has not been researched until the last half of the twentieth century. In the 1960s, child psychologist Boris Levinson published a paper about the progress made with a disturbed child when his dog, Jingles, attended therapy sessions. He later found that many children who were withdrawn and uncommunicative would interact positively with the dog (Endenburg, Baarda, & Robinson, 1995). Research has consistently supported and expanded knowledge about the benefits that accrue when humans interact with other species, and animals appear almost universally to provide a beneficial and positive influence, especially upon children. (Beck & Katcher, 1983). In 2010, researchers at the University of California, Davis found that young students who read aloud to dogs improved reading skills by 12 percent over the course of a 10-week program, while children in the same program who didn't read to dogs showed no improvement. Reading speeds also increased by up to 30 words per minute. Other research with therapy animals indicates that children with low self-esteem are often more willing to interact with an animal than with a person. "The dogs don't care if you read really, really bad, so you just keep going." "If I make a mistake, there's no one around me to laugh." "It's because ... it's just you and the dog." So, can a dog teach resilience? As Marge Scherer wrote in the September 2013 issue of Educational Leadership, "Resilience itself is a learned trait. And one can learn it not just from one's parents but from whoever steps up to teach it." In Orange County schools, that just might be a dog! Beck, A. M., & Katcher, A. (1983). Between pets and people: The importance of animal companionship. New York: G. P. Putnam's Sons. Wendy Stewart works as a licensed school social work specialist for Orange County Schools in Hillsborough, N.C. She is also a licensed clinical therapist with special interest in the areas of critical incident intervention, bereavement, suicide prevention, and pet-assisted therapy. Stewart coordinates the Pet Pals Program and can be reached at wendy.stewart@orange.k12.nc.us for additional information. Steven Weber is a former classroom teacher, assistant principal, and department of education consultant in Arkansas and North Carolina, and is currently the principal of Hillsborough (N.C.) Elementary School. He is a former board member of North Carolina ASCD and a featured guest on the Whole Child Podcast. Connect with Weber on the ASCD EDge® social network, by e-mail at steven.weber@orange.k12.nc.us, or on Twitter @curriculumblog.